Amazon has come into possession of unbundled Crystal White Vitas that it's selling separately for $199. When it comes to gaming hardware I'm a bit of a Model-T sort of guy; I like them dull, boring, and black. I'll also accept charcoal or a really dark gray, but even that's pushing it. In turn, I'll never quite understand the excitement many feel over alternatively colored consoles. I'll especially never get people who already own a piece of hardware and then up and buy a new one because the company decides to release a new version that's "crystal white." 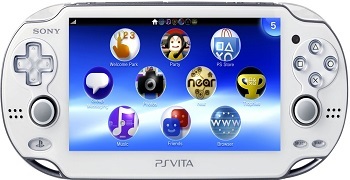 I know there's a market for that sort of thing though, so here you go: the Crystal White Vita. Of course, the white Vita has actually been available for some time now via Ubisoft's Assassin's Creed: Liberation bundle. That being the case, it would seem that Amazon got its grubby little hands on a stock of individual units that it's now selling separately for $199. In other words, if you've fancied a white Vita but weren't too keen on Assassin's Creed, this is your moment to strike. It's fair timing as well because, as we learned at CES, things are set to get pretty exciting for the Vita, and PlayStation in general, in the coming months. I'm, of course, referring to the recent announcement of PlayStation Now which will give Vita owners access to a variety of PlayStation software from the PS1, PS2 and PS3, including games like The Last of Us. You honestly don't get much niftier than that.